Thank you to all the participants and volunteers that made this years Meltdown MTB Race so memorable. Roger sends us his pictures. Meltdown Pictures - Kansas State MTB Championships. Welcome to this years Meltdown. Some exciting news first. The Meltdown was awarded the Kansas State Championships for 2016. For years the Trail Masons have spend thousands of man hours to build what many consider now are the premier trails in Kansas. 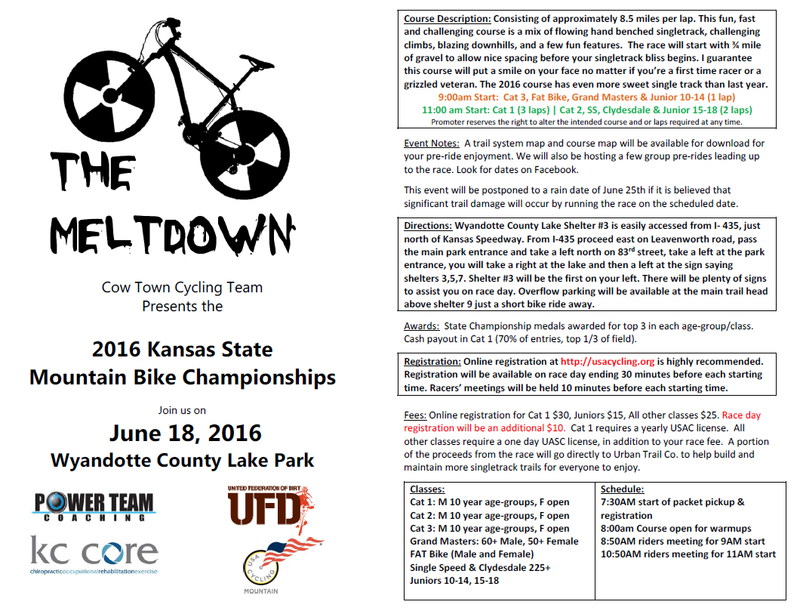 Come join us on June 18th, 2016 at The Meltdown and challenge yourself on the Wyandotte County Lake Trails (WYCO). 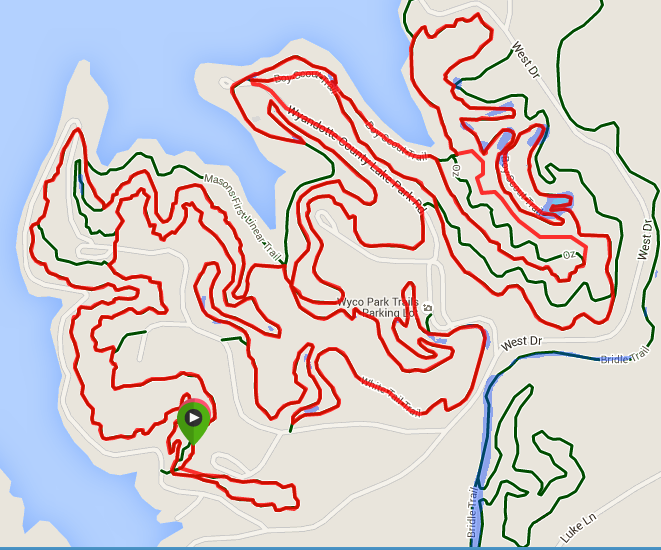 The WYCO trail system is known locally as "Singletrack Heaven". Home to some of the best designed and maintained trails in the Midwest and it is easy to see why the 20+ miles (and growing) trails out at Wyandotte County Lake have earned that name. The Meltdown races will feature events for all ages and abilities including junior classes starting as young as 10 all the way up to 60+ Masters classes and 50+ Female classes. 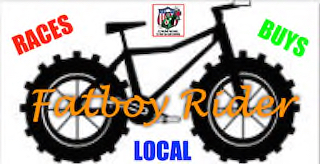 Also included are events for our FAT Bike friends (3.8" tires) and Clydesdale (225+ pounds) riders. 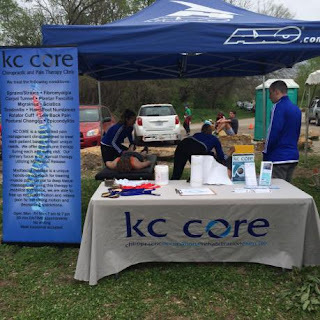 As the Kansas State Championships the event will feature competitive fields, but also focus on raising funds for the DKMS and maintaining our local trail systems. This years event will support DKMS - We Delete Blood Cancer. Help us save life's and delete bone cancer by registering at our donor drive on June 18, 2016. Lantern Rouge will be out on Saturday. As always look for Roger out on course encouraging you to do your best. Registration is easy. 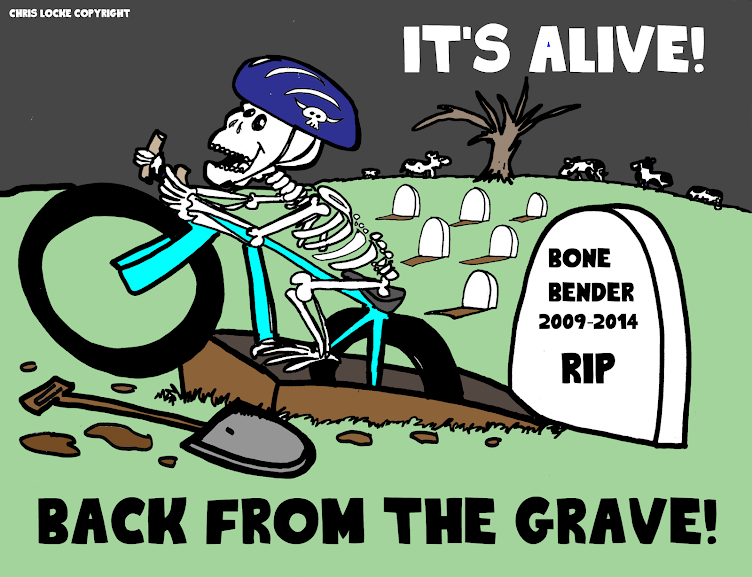 You must have a USA Cycling license or purchase a one-day license $10.00. (Note: USA Cycling is currently has a rebate program where $5.00 from each one-day license will be paid to the hosting club. All rebated funds will be donated to the Urban Trails Co for use at Wyco) Online Registration is open: https://usacycling.org/register/2016-800 . You will have to create an account if you do not already have one with USA Cycling. This is very easy to do. The one-day license will be added automatically when you "checkout" if you do not already have a license. Race day registration is available but we encourage you to signup online which will help our limited team staff and save you money. 9:00 AM Start: Cat 3 Males and Cat 3 Females, Fat Bike (Male and Female), Grand Masters (60+ Male and 50+ Female) and Junior 10-14. 11:00 AM Start: Cat 1 Males, Cat 1 Females, Cat 2 Males, Cat 2 Females, Single Speed, Clydesdale's and Junior 15-18. Awards fore each race once finalized by USAC official. 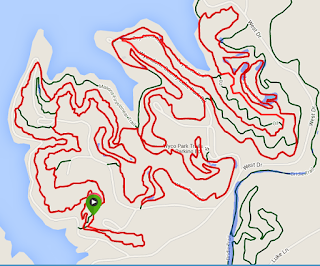 The 2016 course is be close to 8.5 miles in length and feature all the top rated trails our at WYCO.